ImageServ provides document imaging and content management system services. 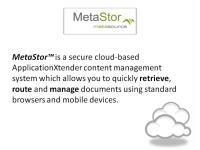 We represent EMC for the ApplicationXtender content management system for instant access to business documents and information at anytime, from anywhere. This technology will dramatically improve operating efficiency thus positively impacting any company's bottom line. This system is available as a premise-based installation on a server in your location or hosted (Software as a Service-SaaS) which offers all the benefits without a large capital investment. Users only pay for the storage consumed; no servers and databases to purchase and maintain. We also offer scanning services to help our customers convert their paper documents to digital and provide them in a format that will allow them to be imported into any content management system or on CD/DVD with search capability directly from the disc. We offer a complete line of Kodak scanners from small desktop models designed to scan an occasional page or two up to high-volume production scanning systems. ImageServ also represents Rimage Corporation, the largest most experienced producer of disc publishing systems for the production of CDs or DVDs. These systems combine multiple CD/DVD recorders, professional surface printing and automated media handling all in a compact, fully integrated desktop system. We also provide disc duplication services. We seek to streamline the business process, positively impacting the bottom line & support it w/ unparalleled svc.